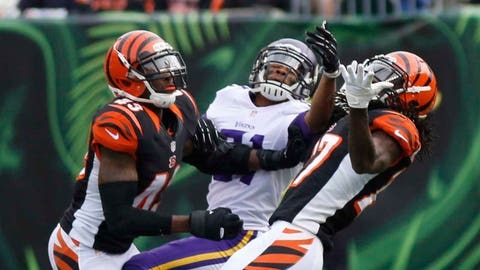 Cincinnati Bengals strong safety George Iloka (left) and cornerback Dre Kirkpatrick (right) break up a pass intended for Minnesota Vikings wide receiver Jerome Simpson during the second half on Sunday, Dec. 22, 2013, in Cincinnati. Iloka intercepted the pass. CINCINNATI (AP) — Andy Dalton gets another chance to show that he and the Bengals can be winners in the playoffs. It’s been a long time since that’s happened. Dalton threw four touchdown passes during a 42-14 victory over the Minnesota Vikings on Sunday, the first step in a series of events that broke the Bengals’ way and got them a division title. The Bengals (10-5) clinched a playoff spot shortly after their game ended, when Miami lost to Buffalo. They wrapped up the AFC North title a few hours later when Baltimore lost to New England, which currently has the No. 2 seed for the playoffs with the Bengals at No. 3. Dalton became only the fifth quarterback in NFL history to lead his team to the playoffs in each of his first three seasons. He has thrown 31 touchdown passes, one behind Carson Palmer’s club record from 2005. To be in the playoffs every year since I’ve been here is huge. It gives you a chance to accomplish the ultimate goal. "To be in the playoffs every year since I’ve been here is huge," said Dalton, who was 27 of 38 for 366 yards without an interception. "It gives you a chance to accomplish the ultimate goal." The Vikings (4-10-1) were looking for another playoff-jumbling upset. They’d knocked off the Bears and the Eagles in the last three weeks, and were hoping to make the Bengals sweat it out a bit longer. Instead, Cincinnati returned a fumble to the 4-yard line, setting up one touchdown, and linebacker Vincent Rey returned an interception 25 yards for another score as the Bengals put it away early. "Well, we did take a step back," said Matt Cassel, who was 13 of 27 for 114 yards with one touchdown and three interceptions. A TITLE TEAM: When the Bengals started the season, they set three overriding goals: Go unbeaten at home, win the AFC North and get deep into the playoffs. After Sunday, they can start checking items off the list. They’re 7-0 at home and they’ve got their first division title since 2009 and their eighth in their 46 seasons overall. It’s the first time they’ve reached the playoffs three seasons in a row. Still in play: They haven’t won a playoff game since 1990, a stretch of futility that’s tied for seventh-longest in NFL history. Winning the division title gives them at least one home playoff game, which could help get that breakthrough win. HARDY AT HOME: The Bengals have scored more than 40 points in each of their last four at Paul Brown Stadium, a club record. They’re 7-0 at home for the first time since 1988, when they went unbeaten and won two playoff games on their way to a Super Bowl loss to San Francisco. They finish the regular season at home next Sunday against Baltimore. DALTON’S PLACE: The third-year quarterback has been particularly good at home, throwing for five, three, three and four TDs in his last four games at Paul Brown Stadium. The spotlight will be on him more than anyone else heading into the playoffs. He had miserable games during playoff losses at Houston that ended each of the last two seasons. "We’re in a really good spot right now," Dalton said. "We’ve just got to keep it going." GENEROUS VIKINGS: Minnesota’s defense has come apart down the stretch. The Vikings have allowed 467 points this season, the most in the NFL. They’ve given up 40 points four times in the last nine games, although their offense was responsible for two of the touchdowns on Sunday because of turnovers. "I can’t speak for the whole defense but for me, it’s embarrassing," defensive end Jared Allen said. "I don’t know what to say. I still remember the days when we thrived on defense around here." PETERSON’S HOBBLED: Running back Adrian Peterson missed last week’s game because of a sprained right foot. He was limited in practice last week but wanted to play. He wasn’t the same, managing 45 yards on 11 carries before coach Leslie Frazier benched him in the second half with the Bengals in control. "I lobbied a little bit (to stay in), but is it really worth the risk?" Peterson said. "I don’t feel like I played with as much confidence as I need. I was a little hesitant. My body is just not responding like I want it to."